Reply to the message if you can do so in a minute or two. If no response is required, review the message and file it to a Project folder. Defer messages that you aren’t ready to deal with to a later date. Create a task from email that requires further action on your part. Assign Projects to tasks as you create them. Schedule appointments from messages that require a meeting. Assign Projects to appointments as you create them. Use the Delete key to delete messages that you don’t need to keep for archiving purposes. The end result will be a cleared Inbox and a prioritized task list, allowing you to focus on your work rather than your email. As you act on email, assign a Project and allow ClearContext to automatically file the original message from the Inbox into a Topic folder. Posted by brad at 11:07 am on August 31st, 2010. Do Not Disturb disables all default Outlook notifications for new messages, including New Mail Desktop Alerts, changes in the mouse cursor, the envelope icon in the system tray and the default new mail sound. To use this feature, select Do Not Disturb from the ClearContext menu. In the Do Not Disturb dialog, select the length of time that you would like to have new mail notifications disabled and click OK. When the time frame specified has past, ClearContext will re-enable message notifications. If you would like to reset your notifications prior to the expiration time, select Do Not Disturb from the menu again. Do Not Disturb will also reset notifications if you restart Outlook. By default, the Inbox toolbar does not include the Do Not Disturb button. You can add it to the toolbar via toolbar customization. When you’re ready to focus on your projects, use Do Not Disturb to ensure that you aren’t distracted by incoming email. Posted by brad at 6:31 am on August 19th, 2010. The Email Activity Index provides an overall assessment of how effectively you’re managing your email and how heavy a workload you’re facing. To view your Email Activity Index, click More at the bottom of the Dashboard or selectScorecard from the ClearContext menu. A browser window will open, displaying your some basic stats about your email usage along with the ClearContext Email Index. Excellent (80 – 100): great job at staying on top of email and getting a lot done! Very Good (60 – 79): you are doing a good job at keeping up with email! OK (40 – 59): you are just managing to stay in control of your email. Warning (20 – 39): you are falling behind in your email communications. Danger (0 – 19): Your email is getting totally out of control. Posted by brad at 6:30 am on August 18th, 2010. 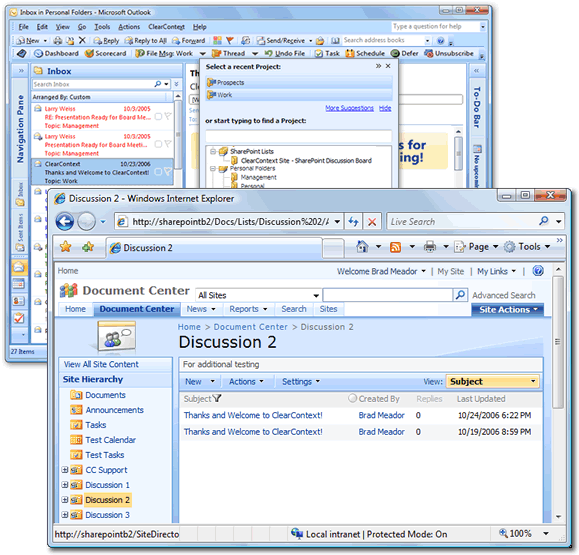 ClearContext allows the designation of a secondary message store (such as SharePoint Lists in Outlook 2007/2010, Public Folders, or an alternate Personal Folders file) as a secondary Project Folder repository for easing sharing of message conversations outside of the primary mail file. 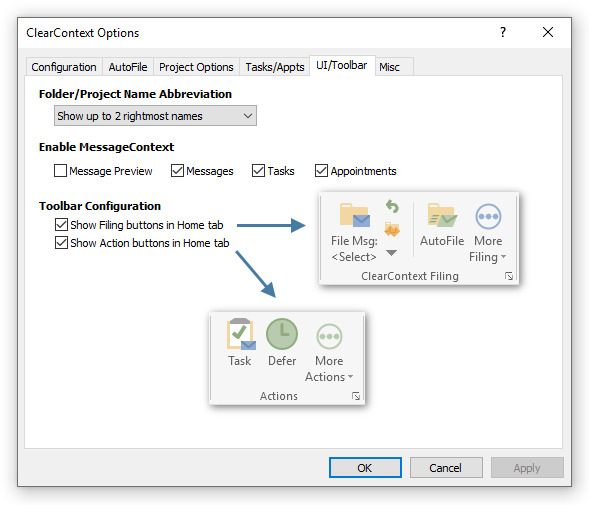 Designate the secondary message store via the Configuration panel and ClearContext will automatically convert folders within the data store to Projects. These shared Projects can then be assigned to message conversations and ClearContext’s file buttons will automatically move messages to the alternate location. To designate a alternate message stores, open the ClearContext Configuration menu at ClearContext > Options > Configuration. After a restart of Outlook, ClearContext automatically populates the Project list with folders in the data store. Select Public Folders to share to Exchange Server public folders. ClearContext will convert all Mail and Post public folders into Projects, while ignoring folders of other types (Contacts, Tasks, etc.). (Please note that in some versions of Outlook, the name for the public folders data store is listed as Microsoft Exchange Server). Select SharePoint Lists to instruct ClearContext to recognize SharePoint discussion lists that have been connected to Outlook 2007 and greater. To connect a SharePoint discussion, open the discussion site in a browser and select Actions > Connect to Outlook. This feature is not available in Outlook 2003 and earlier. After a secondary message store has been added via Configuration, shared folders automatically appear at the bottom of the Project list. Shared Project assignment and filing then works exactly like Project assignment using primary Projects; assign a shared Project and all current and future messages in the conversation will be assigned that shared Project. Use any of ClearContext’s filing buttons to automatically move these messages into the shared message store. 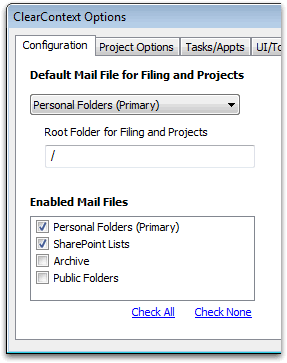 By default, ClearContext enables all open mail files as project folders. Remove archive folders from this list at ClearContext > Options > Configuration if you don’t file to them. Posted by brad at 6:28 am on August 17th, 2010. The v5.1 release has introduced many new time-saving enhancements to the product. We’re posting the updated User Guide over the several weeks. ClearContext AutoAssign functionality lets you create rules to automatically prioritize and/or file your incoming email based on parameters that you set. By using AutoAssign, you can easily organize messages such as newsletters, business email, and personal correspondence. Create an AutoAssign rule by selecting the AutoAssign button by accessing AutoAssign in the ClearContext options menu. AutoAssign rules can be created based on any combination of the factors below. In italics, we have highlighted examples of the types of email messages that might be filed using these rules. Sender email or domain address – These parameters are used to execute a rule based on the email address or domain that sent the email. Enter multiple addresses separated by a comma. Designate emails from your boss with a project such as Work. Designate messages from a certain domains as a project such as Newsletter and automatically file them out of your inbox where you can read them later. Message is addressed to – This parameter can be used to apply a rule to an incoming message based on who the message has been sent to. Enter multiple addresses separated by a comma. Categorize emails sent to both you and your boss with project Management. Use Mark Important to assign a priority to messages sent to a business or private email address so these emails are automatically highlighted in your Inbox. Keywords contained in the message body or subject – ClearContext can search incoming messages for keywords that you designate. Designate an exact phrase or multiple keywords via the radio buttons above the rule. Set the project for regularly received emails with a certain subject (like "Order Information") to a project such as Receipts and automatically file these messages. Search for keywords such as a stock symbol or major client name and Mark these messages Important. Assign to project – designate a specific project to be set for these messages. This project can be used to both identify messages by project in the Inbox and for automated filing. Assign Priority – assign a priority to these messages. This priority will set the color of messages in your Inbox. 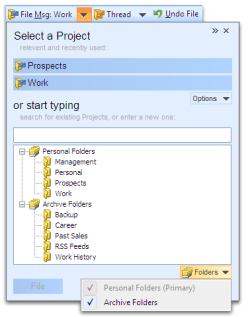 File Immediately – messages processed by the rule can be automatically filed to the designated project folder. This is very useful for messages such as Newsletters and Mailing Lists that can be automatically moved out of the Inbox into their own folders. Overwrite existing project – this forces the rule to overwrite the project on messages that are part of a thread with a previously assigned project name. The AutoAssign Management Dialog allows the user to create and maintain AutoAssign Rules. The dialog can be accessed directly from the ClearContext Menu (ClearContext > AutoAssign Management). Use the arrows on the right hand side of the window to move a rule up or down in priority. Once a single rule is executed against a message, the following rules are ignored. To execute all rules against the inbox, click the Apply Rules to Inbox button on this dialog. By default, the Inbox toolbar does not include the AutoAssign button. If you find yourself creating many rules, add it to the toolbar via toolbar customization. Automated Rule Creation: To create an AutoAssign rule for a type of message (for example a newsletter that you would like automatically filed), highlight the email message, click the AutoAssign toolbar button, and the email’s parameters (address, subject, etc.) will be pre-filled in the AutoAssign rule creation dialog. Posted by brad at 6:26 am on August 16th, 2010. 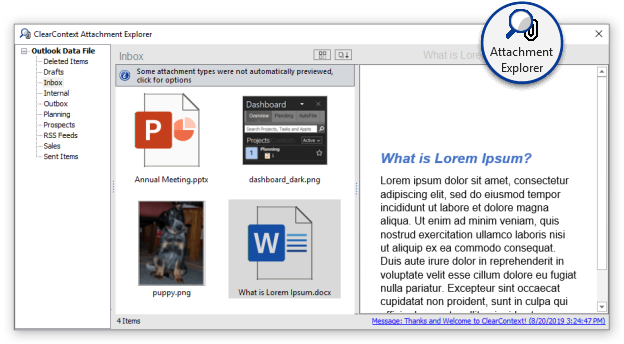 The Attachment Explorer allows you to preview attachments within Outlook folders as if you were viewing them in a Windows file folder. Click the Attachments button on the Inbox toolbar. This button must be added to the Pro toolbar. Once you have opened the folder you want to explore, click on a file in the left hand pane to see a preview in the right hand pane. Some file types cannot be previewed. Open a different folder by clicking on the folder name at the top left of the Attachment Explorer dialog. Select the Views header to choose various views, switching to a smaller detailed list of the attachments in this folder, larger thumbnails, etc..
Click the Sort Header to change sorting by attachment name, type, received date, etc.. Drag the bar between the attachment list and the previewer to change the width of these panes. Double-clicking an attachment in the file list will automatically open the message it is attached to. Quickly open the email that contains the attachment you are previewing by clicking the link at the bottom of the preview pane. Posted by brad at 6:24 am on August 13th, 2010. The ClearContext Organizer provides a simple way to assign due dates, projects and categories and a central place to review your work. Open the Organizer by pressing Organize Tasks on the Summary Dashboard, Organize on the Project Dashboard or select it from the ClearContext Inbox menu (ClearContext > Tools > Organizer). The organizer is divided into four tabs to quickly sift through your data – Dates, Project, Category and Review. Right click selected tasks to act on them (Mark Complete, Change Due Date or Change Priority). Click on a list header to sort tasks. Grouping will not change when you sort – tasks will be sorted within the tab’s defined groups. Click on a group header to select all tasks in that group. The Dates tab lets you quickly identify overdue tasks and/or tasks with no due date so that you can reassign due dates in bulk. Highlight the tasks that you want to reassign. Use the buttons at the bottom of the window to assign the due date on the selected tasks to today, tomorrow or to a due date of your choosing. View a list of all of your tasks by Project. Tasks which have not been assigned Projects are listed at the top of the list. Highlight the tasks you want to assign Projects to and select Assign Project to assign via the Project Selector. The Category tab works in the same way as the Project tab. Assign a category to tasks by pressing the Assign Category button at the bottom of the panel. View Completed shows tasks that have been marked complete and appointments that occur in the past. 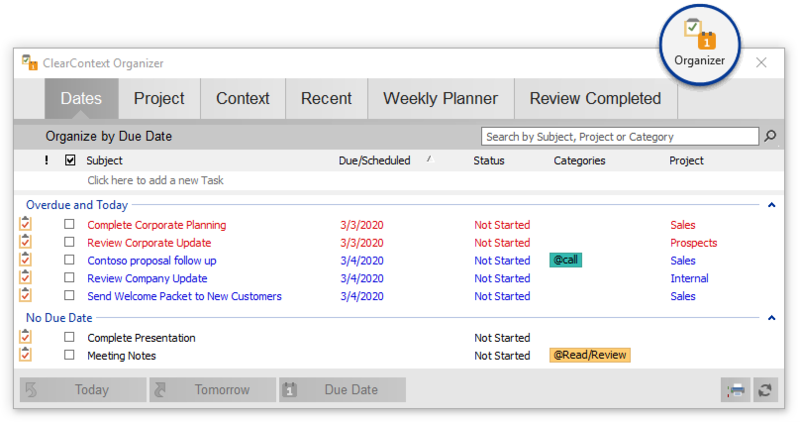 View Pending shows uncompleted tasks and appointments that occur in the future. The Project and Category buttons allow you to filter your list by an individual Project and/or and individual Category. Use the Weeks buttons to select the number of weeks you want to view in your list. Once you have filtered the list, print it via the Print button. While in a Project Dashboard, quickly launch the Project tab of the Organizer by pressing the Organize button. Posted by brad at 6:22 am on August 12th, 2010.